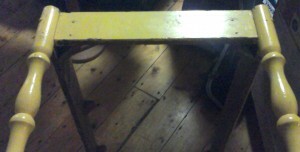 Last year at Norman’s Attic I bought a yellow coffee table apron/leg for $5.00 hoping to use it for a table. It’s rather large and I have been staring at it for over a year wondering what I to do with it. 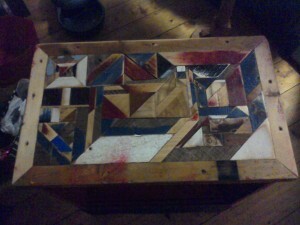 I thought about taking barn board, cutting it to length and making a very simple coffee table. I really wanted to make a mosaic for it but I did not have a piece of wood big enough to use as the base so I moved the yellow base around hoping for inspiration. 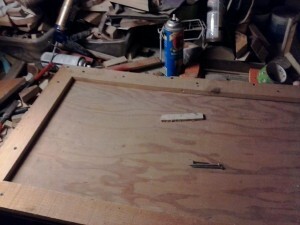 I found a piece of wood that will fit the span and I started work on the coffee table a few days ago. 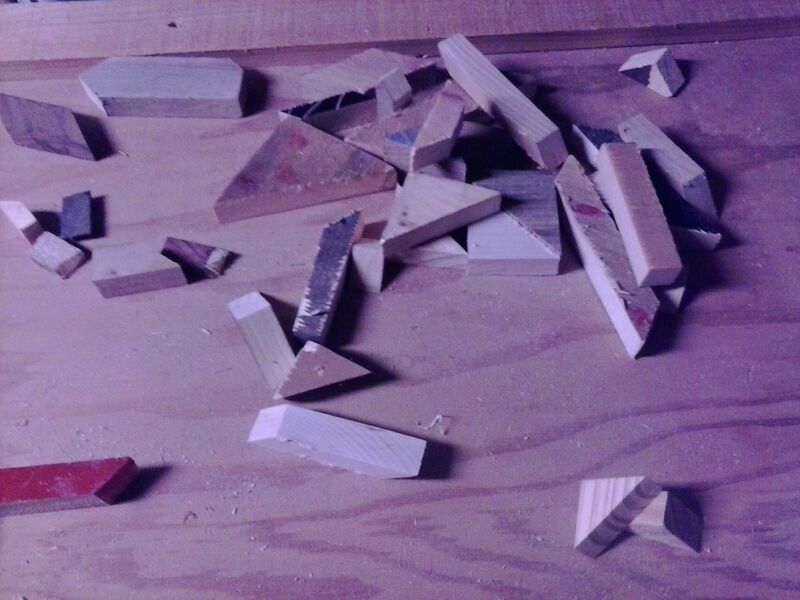 Creating the mosaic’s takes time, i Have to assemble enough decent scrap stock, cut it to fit and find the right surface to use as my substrate.In the past I have used rough cut pine, ship-lap, and plywood as a base for the mosaics. Before I start adding the pieces I have to prep the surface and add a frame. Prepping is different for each type of substrate, I may have to glue a few pieces of wood together to get the right width, or I may have to clean it and sand it a bit Adding the frame is a standard procedure and a lot can go wrong. Since I am working with scrap I have a limited stock and if I cut something to the wrong length most of the time I don’t have the option of doing it again. Adding pieces I am using more color on this one because the base is yellow. The ideal frame is wide, but not too wide, and covers when edge of the substrate completely. 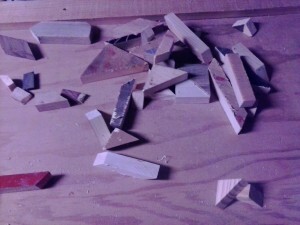 Since I am using scrap I do occasionally have to piece together an edge. It looks fine when done this way, just takes a little extra effort when it is being glued. When my frame is cut I attach it to the base. I did not always do this, but it makes a huge difference it the quality of the mosaic. I also screw together the corners. First I drill pilot holes to minimize any cracking, then I screw the corners together with 2″ screws. Once the frame is attached I start adding pieces. I don’t have a pattern in mind when I add pieces I just work it out as I go along. I use the blocks that I have pre glued and individual pieces to create abstract mosaic table tops, and wall hangings. 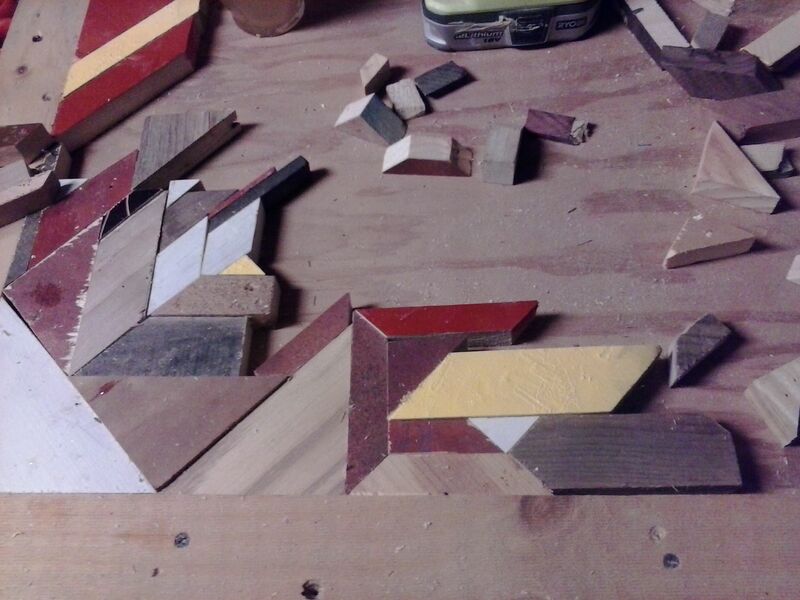 Once I have added all the pieces I unscrew the frame from the base, leaving the corner screws in place, if I have done things right the pieces are so tightly put together that I can just life the mosaic, in tact, from the substrate. I apply my adhesive, reattach the face, clamp it and let it dry overnight. When it is dry I remove the face screws and screw the frame in from the bottom. I sand, add trim, and finish and finally the table is ready for use. This entry was posted in barn board, repurposeing, scrap wood, tables, wood working by brighid. Bookmark the permalink.